The Client intends to develop a web based Ecommerce system. In which user can create recipe, their variants, and quotations and calculate different types of freight and tax charges involved. This website provides an open, friendly, atmosphere where people can create own recipe, variants of recipe, quotations of recipe, keep track of all the freight and labor charges. Application provides various features to track different recipes, quotations associated to them. Tax charges for US and Canada users are separately calculated.Application provides perfect security solutions to the users. Automatic blocking of the users after entering wrong credentials is provided. 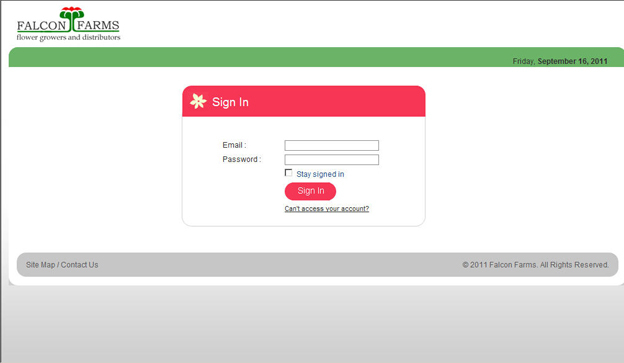 A) Login Page: This the main page of the application before login, once user comes into this page he/she can log in. 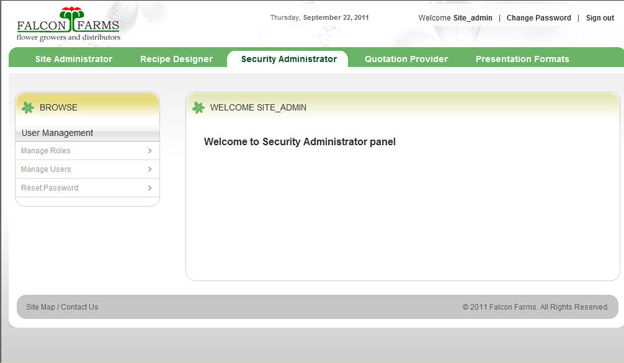 B) Site Admin: The following page is given when a user logs in using the credentials of Site Administrator. 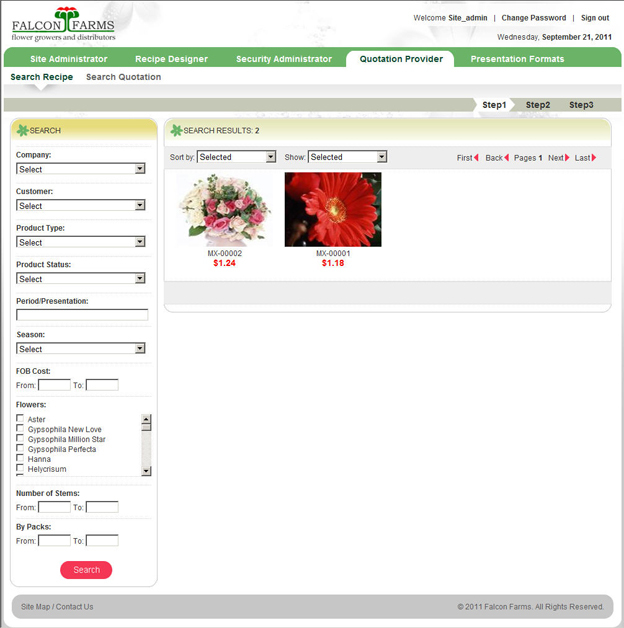 User can manage different attributes such as Manage Customers, Sales Persons, Locations, Origin points of Flowers, destination points, Price settings of flowers, fillers, greens etc. User can also update the price through import and export of excel sheets. 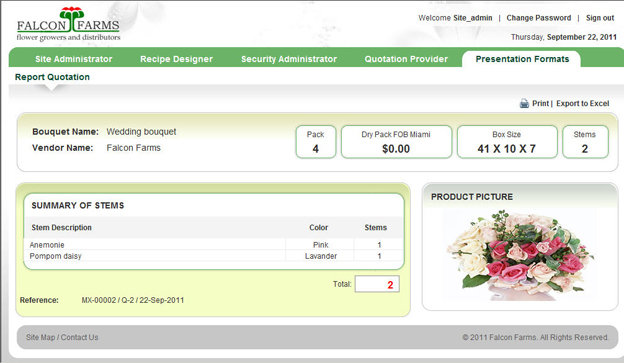 1C.Create Recipe: Users can create recipe o bouquet by for respective company, customer and season. Different types of bouquet can be created such as Mixed Bouquet, Consumer Bunch, Foam Arrangement, Rose Product, and Bulk. 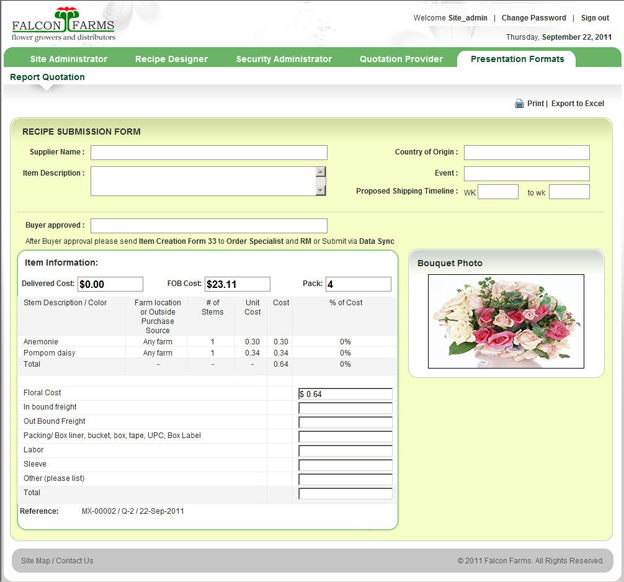 User will create the recipe after selecting the header options of Company, Customer, Product Type, Season etc. 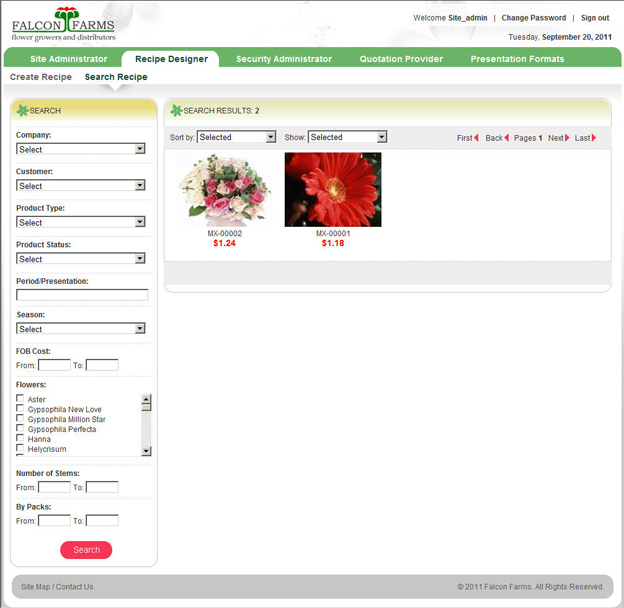 For selecting the input to the bouquet the user will have to select from Flower, Filler, Greens and Focal. After selecting the Inputs user will select Hard good materials and Packing Materials. The images for the recipe and the hard goods used can uploaded as well. Once the recipe has been created it can be finalized by publishing the recipe. A variant can be created once a recipe has been Published. The functionality to build any number of variants is provided. 2C. Search Recipe: In this section user finds all recipes created. 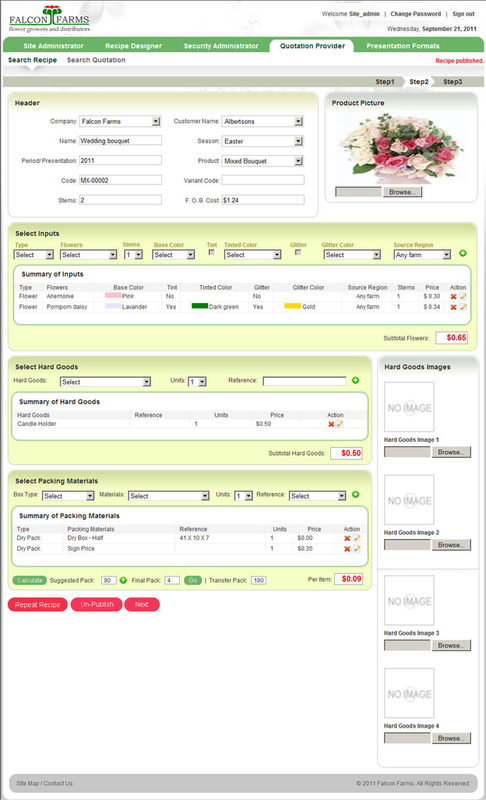 User will have the option to sort the recipes with price range and no of recipes to be shown. The recipes can be searched on the basis of different criteria such as Company, Customer, Product type, Product status etc. User can select recipe to update from here. 1D. 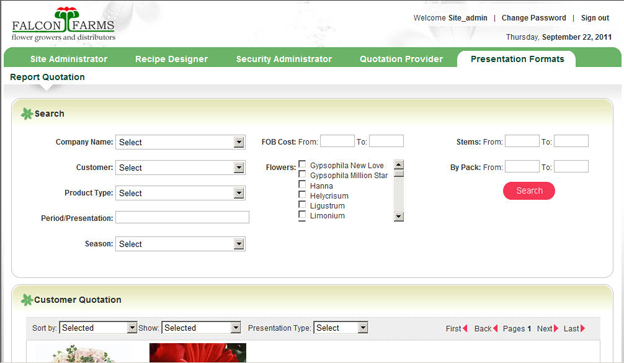 Search Recipe: User can log in to quotation provider to create quotation for recipes. It will show three screens starting with Search Recipe option. The recipe, against which the quotation is to be created, will be selected and the next step for quotation will be shown. 2D. Update Recipe: User will find the second step in quotation building process as under. User is allowed to have a look at the recipe for which the quotation is to be created. Option for making a variant recipe is also provided here with. 3D. 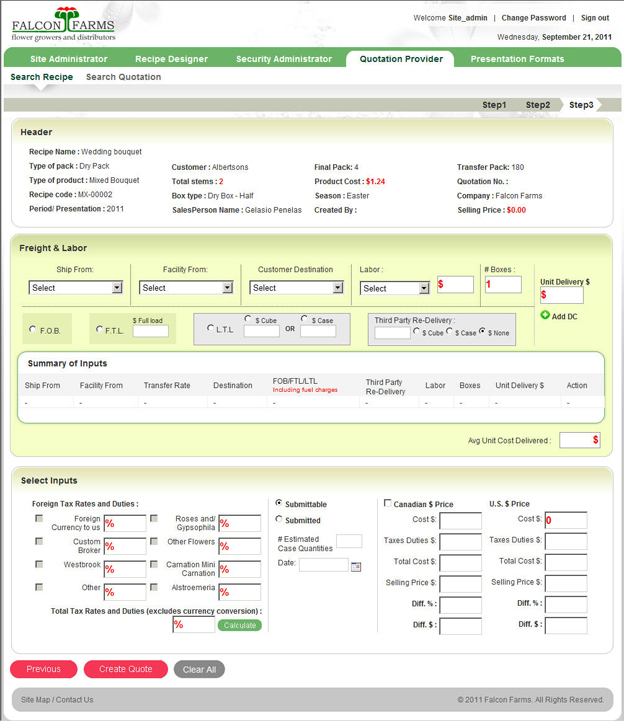 Create Quotation: On the third page of the quotation building process user can create the quotation. The taxes and freight charges will be managed in this section. Different type of freight rates are made available in this section. The rates will be controlled from the site administrator module and the calculations will be done here. Different taxes for US and Canada will be calculated. 4D. Search Quotation: This section shows the quotations created by the user. 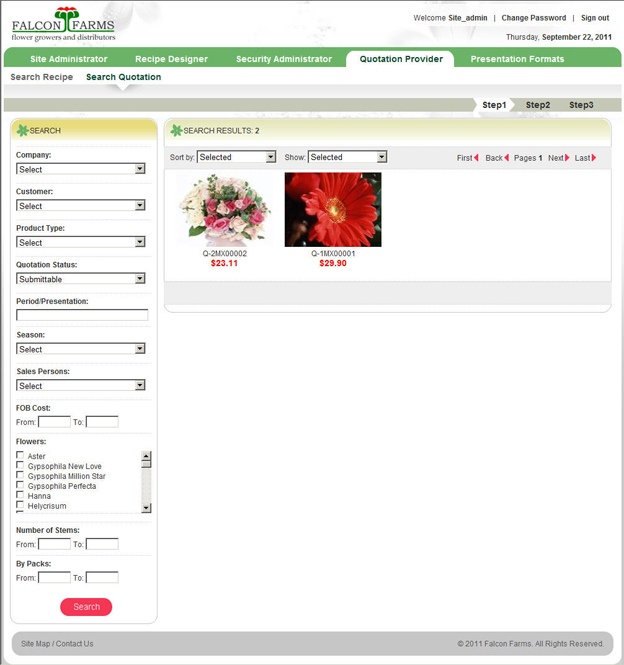 The quotations can be filtered and searched by different options. The quotation which user wants to edit or update will be selected from this section and further can be saved. E. Security Administrator - It will facilitate the users to deal with security concerns. 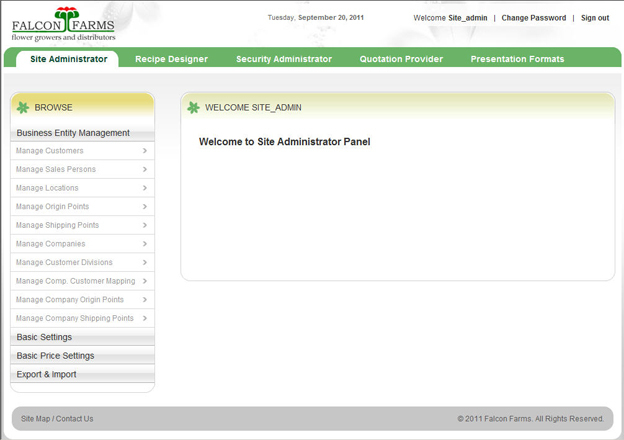 To manage users, manage the roles assigned to them. Users will be provided the option to reset the passwords of different users. F. Report Quotation: The quotations created for the recipes can be presented in form of presentations of different formats from Report Quotation module. The presentations can be edited by adding different information. The user can also export these presentations in excel. 1F. Walmart Presentation: Different formats of presentation formats can be defined for the quotations created. The walmart form of presentation is as below. 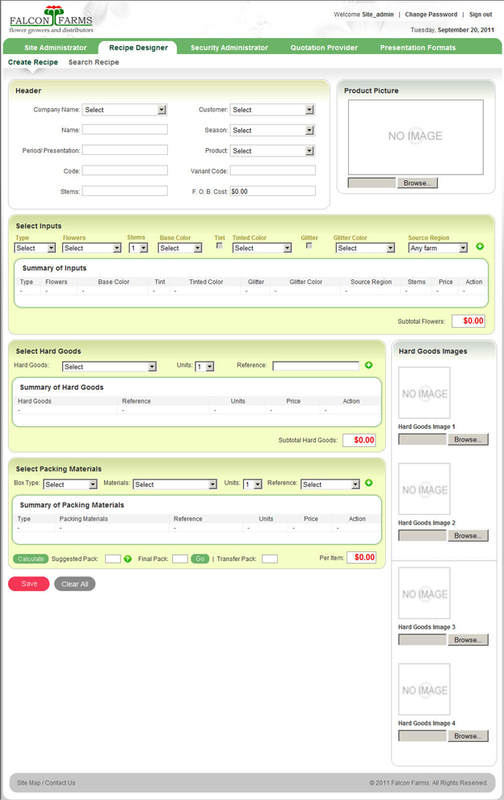 Some fields can be included as well before getting the print or excel. In walmart presentation a brief information of the materials used can be shown and edited as per convenience. 2F. Generic Presentation – Another form of presentation format which can be generated is the Generic form. In Generic form, very few details of input information can be found. The information shown on this type of presentation format is very generic and no information can be added. Only the values shown in the format will be exported in the excel sheet. The major challenge that we faced while developing this site was the creation of Recipe Designer module where no of inputs of different forms are to be handled at the same time. Every input has dependencies on several attributes. Creating any no. of variants for a recipe and variants of variants was a typical functionality to be implemented. Also it was need t checked every time that no recipe can be unpublished whose quotation already exists. The implementation of quotation logic for different shipping and destination points was a good achievement. Formation of no. combinations of shipping and destination points and their different freight rates applicable for different types of transportation facility was appreciable. 1.Managing different inputs for Recipe Designer: By maintaining dropdowns for various inputs and associating them to different attributes at the same time, from site admin module.